I wanted to take a few moments to pass along some interesting facts and figures from our Pacific Puddle Jump, so that future jumpers might be able to have some idea of what worked for us... your mileage will vary. Wind wise we had a great crossing! 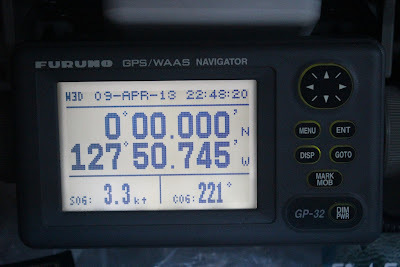 There were a few light wind days towards the beginning, but still enough wind to sail along in the right direction. This was mostly luck, as people who left a week later than us experienced up to 5 days of dead calm!! 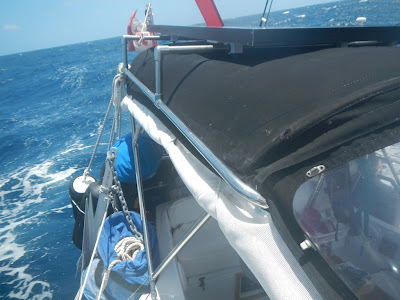 The highest wind we experienced on the whole crossing was about 30 knots during a squall. Otherwise the average was probably around 15 knots. Our engine hours were so low as a result of the great wind, and the fact that we did not need to run the engine for recharging our batteries. On top of the great wind, we had a lot of sunshine which allowed our 270 watts of solar panels to keep us charged up! We were very pleased with this, since our fuel capacity is only 50 gallons. Keeping the battery charged was a concern of ours initially, since I wasn't sure how much our sails would cast shadows on the solar panels. Since we are so close to the equator it worked out that the solar panels were unobstructed most of the time, and even with Anne-Marie being net control for the Puddle Jump radio net (a power consuming ordeal) we were able to keep well charged. Hands & dishes washed completely in salt water. 2-3 shots of fresh water per person teeth brushing. Using a bucket in the cockpit with no fresh water rinse. This is how we always shower anyway, usually by diving in instead of the bucket. Hand washed our laundry in the bucket with salt water only, no fresh rinse. We were very pleasantly surprised how well that worked out, we could hardly tell the difference compared to fresh water cleaned laundry. Jonathan would put the juices from canned goods (like corn for example) to other uses such as boiling pasta, which also helped a lot. Other than the above means to save water, there were no restrictions on how much people drank. One of the two bolts on the starboard side snapped, leaving the hand rail and solar panels drooping precariously. 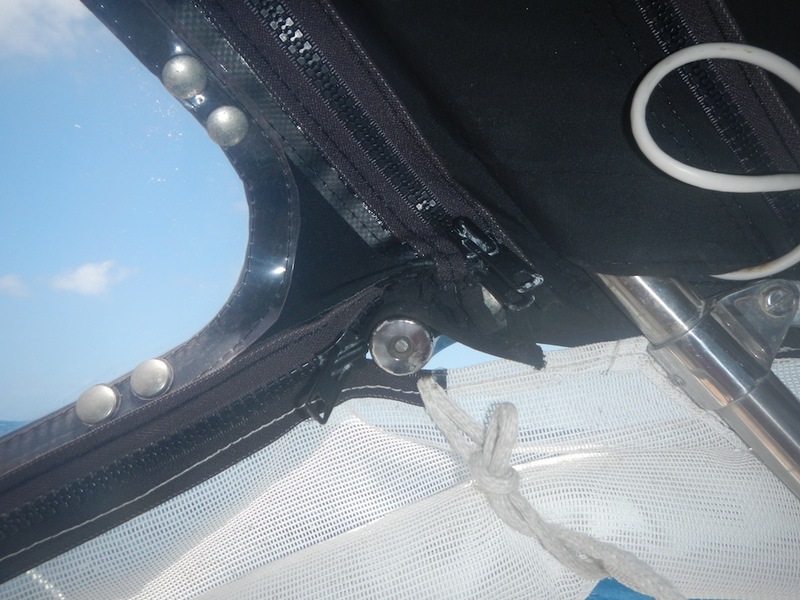 Luckily no one was hanging on for dear life when it happened, and it was quickly repaired. The bolt that broke is right where we always get on/off the boat, so it was probably overworked for years. It has always been precariously mounted on the bow pulpit, and a sail knocked it off. Totally shredded in a squall at night. We are probably just going to throw it out, as the cost of repair will likely be prohibitively expensive, and it is a "luxury" sail. 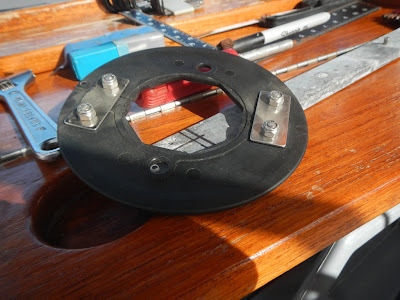 Our mast collar sheared off the deck during the squall which shredded the spinnaker. We believe it was a result of using our whisker pole as the spinnaker tack point, putting undue stresses onto the bottom of the mast. This has since been repaired. We had a standard car stereo which finally gave up the ghost. Luckily I was right beside it when it started to smoke! 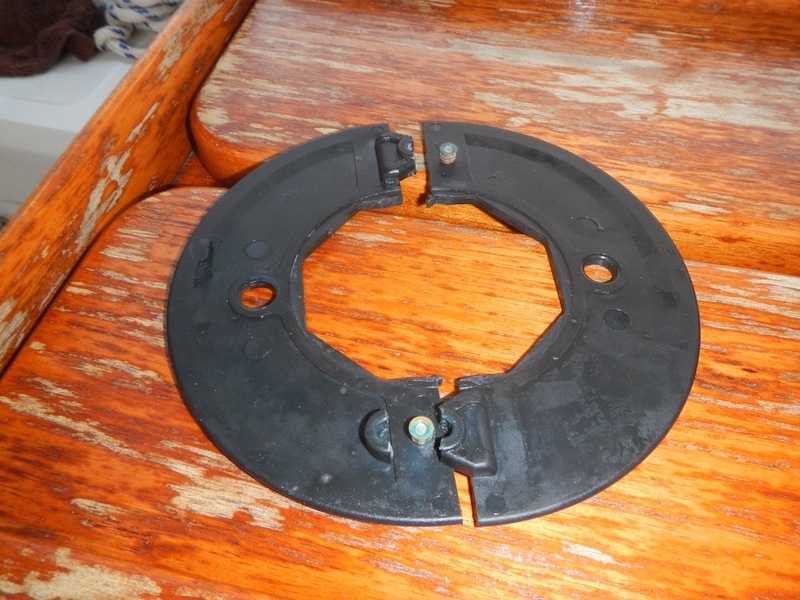 Our Harken Cruising I Roller Furling broke while trying to bring in the 155% jib (perhaps a bit too much sail for it). Luckily it was easy to repair and I believe stronger than before. Very interesting blog Chris!!! Not that I ever will need this info for myself but reading all summarized in such a scientific way made me happy that you not only take such good care of yourself but also think of others. May be you should have added that the Bimini Hand Rail should definitely be checked when frequent visits from the captains parents in law are the norm. Never would have guessed strong family bonds will need strong Bimini Hand Rails.....still learning about your wonderful sailing adventure. 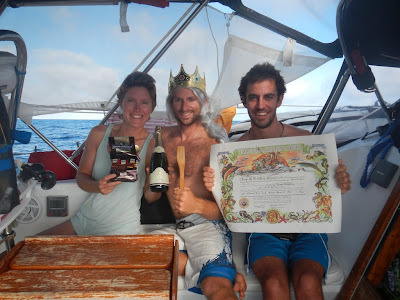 Huge congrats guys, been awesome following your blog. 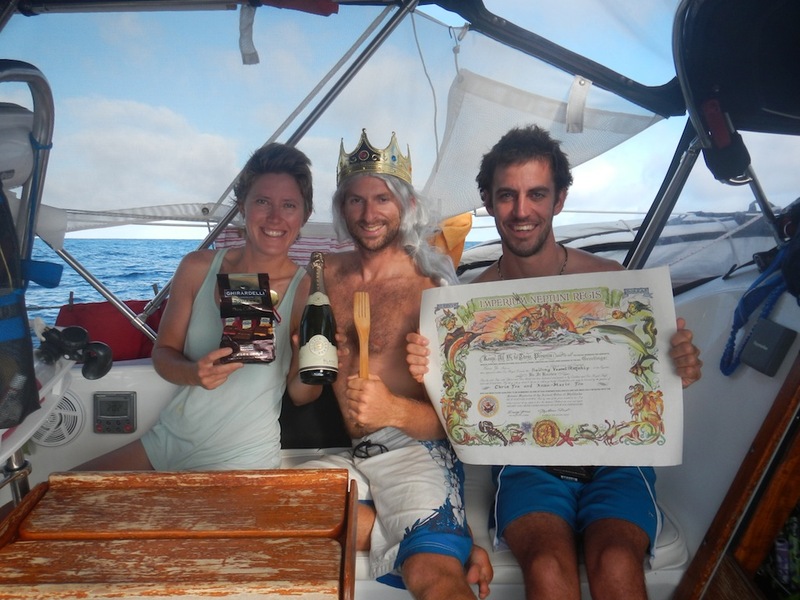 Question - noonsite.com is reporting that French Polynesia just changed their law and now you can stay for 18 months. Anyone there aware of this and/or is this real?